Summary: branch line to Leeds 230km/h over M62, track height over Methley Lane 9m, steep dive into cutting under Fleet Lane, into 1 mile long tunnels, main line continues at 360km/h north on 29+m high 2.2km long viaduct – highest visual and biodiversity impact ratings! 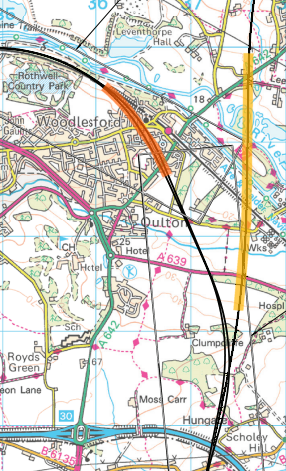 The map above shows the approximate route of the main and branch lines, the tunnel section in orange and viaduct in yellow. For detailed maps please use the links above. This entry was posted in Route on November 15, 2016 by Latest News.